This is the second in a series of visualizations on legal employment outcomes for the Class of 2018. Following posts on outcomes in Illinois and Pennsylvania, here is a visualization for legal employment outcomes of graduates of Texas law schools for the Class of 2018. (More about the methodology is available at the Florida post.) Last year's Texas post is here. Total jobs improved notably in bar passage required jobs, from 1321 to 1366. J.D.-advantage jobs declined. Total graduates increased to 1979, up from 1959. Placement improved from 75.8% to 76.3%. This is the second in a series of visualizations on legal employment outcomes for the Class of 2018. Following a post on outcomes in Illinois, here is a visualization for legal employment outcomes of graduates of Pennsylvania law schools for the Class of 2018. (More about the methodology is available at the Illinois post.) Last year's Pennsylvania post is here. Total graduates were down slightly year-over-year, and the job picture improved a little, with 85.2% employed in bar passage required and J.D. advantage positions, including 11 school-funded positions. Total placement fell slightly, so the improvement is attributable to the slightly smaller number of gradates, from 1256 to 1238. Following up on a series of posts last year (and previous years), this is the first in a series visualizing employment outcomes of law school graduates from the Class of 2018. The U.S. News & World Report ("USNWR") rankings recently released, which include data for the Class of 2017, are already obsolete. The ABA will release the information soon, but individualized employment reports are available on schools' websites. The USNWR prints the "employed" rate as "all jobs excluding positions funded by the law school or university that are full-time, long-term and for which a J.D. and bar passage are necessary or advantageous ." It does not give "full weight" in its metrics to jobs that were funded by the law school. USNWR gives other positions lower weight, but these positions are not included in the ranking tables. And while it includes J.D. advantage positions, there remain disputes about whether those positions are actually as valuable as bar passage required jobs. 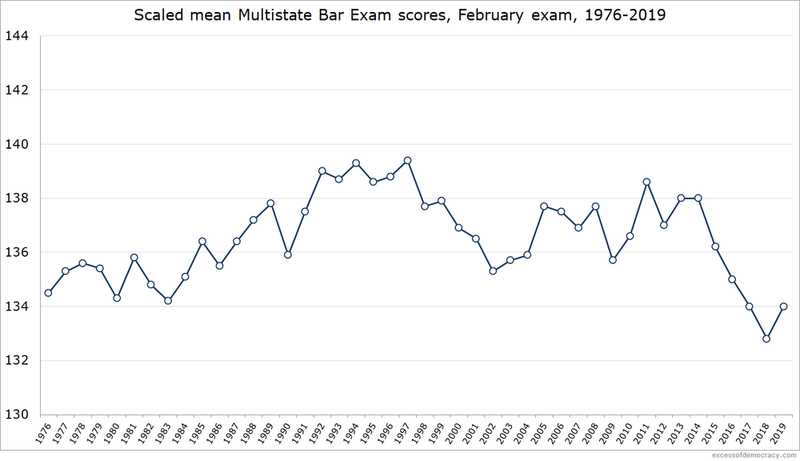 (Some have further critiqued solo practitioners being included in the bar passage required statistics.) Nonetheless, as a top-level category, I looked at these “full weight” positions. The first state is Illinois (last year's visualization here). There were 1696 statewide grades, a 3% decline over last year's class. The total placement rate among the graduates was 82% (including a few school-funded jobs). It is, once again, a slight improvement over last year driven by the smaller class size. Placement in bar passage required jobs fell slightly again. I offered a few thoughts on Twitter recently about advice to students looking to enroll in classes. It became popular advice, and then some people added nuance or qualifications, so I thought an extended discussion here might be warranted. While I teach at a law school and think specifically about that, the advice can work well for higher education generally. 1. Take the professor, not the course. In my seven years of higher education, I never regretted a course I took with a professor I liked in an area outside of my specialties or interests; and I’d say all of my least-favorite courses came in courses I felt like I “had” to take or “ought” to take for one reason or another. The quality of the professor often makes or breaks a course. In my conversations with students about their favorite and least favorite courses, it usually turns on naming the professor rather than the contents of the course. There is a risk that this becomes some kind of cult of personality around faculty. But I do think we are inclined to learn best from the people we best understand, or whose teaching style is most interesting to us. There is a risk, too, that we ignore courses that are essential for our major or for an area of legal practice. But I don’t worry too much about that (but it does give me some pause). For one, if you like all the faculty in a different area—criminal law when you want to be a corporate attorney, for instance—maybe you picked the wrong field or the wrong school…. And there are some courses that are simply unavoidable, often because they are required. And there are courses I really value taking as courses I felt would help my career—federal courts and criminal procedure in anticipation of my clerkship, for instance (even though I did like the professors!). But I advise students to be cautious when thinking about course selection. 2. Find courses with writing and substantial revision requirements. Who hasn’t been the student relieved that they have no exams and only paper courses? But school—particularly, again, I think of law school—is a tremendous opportunity to improve one’s writing ability without the pressures of, say, a demanding client or boss frustrated with your writing ability! Writing opportunities, then, are terrific places to improve this craft. But it’s not just dumping words onto a page at the end of the semester. Find courses that also include revision requirements—a draft due early, a professor’s feedback about the piece’s strengths and weaknesses, and an opportunity to improve it. In law school, this is an essential component of legal research and writing. But finding such opportunities in the upper-division curriculum requires you to seek them out—and requires faculty willing to incorporate draft revision in the syllabus rather than simply expecting some paper at the end. 3. Pick a schedule with course times that help your self-discipline. I loved 8 am courses in school. In college, they helped keep me on a disciplined schedule and ensured I didn’t skip breakfast on my meal plan. In law school, they kept me and my wife (who worked) on similar schedules. I liked morning courses because I paid attention best then; I liked doing homework in the afternoon. I liked scheduling classes every day because it forced me to get into school every day to study. In short, I found out what worked best for me and made sure I planned schedules around it. Too often, it’s tempting to develop schedules around what is convenient. Convenience may be important, but self-discipline—developing habits that will help you avoid your own weaknesses or temptations, like procrastination or laziness—is crucial to future success. 4. Do not assume an elective will be offered next year: take it now. You’re looking at the schedule, and you see a neat course with a professor you like. But it’s an inconvenient time, or it runs up against a requirement in your discipline, or whatever it is. And you think, “Well, I’ll just take it next year.” Don’t do that. Don’t! Schedules are fickle things. Faculty lateral to another institution, go on sabbatical, visit elsewhere, take parental leave, or retire. There’s a deficiency in another area, so faculty give up the elective to help teach something else. Research interests shift. Low interest means the course isn’t offered again. There are a thousand reasons that there is no guarantee that next year will allow this course to return. So take it now (if you can). There are of course many, many factors to consider when scheduling courses. (Many on Twitter have been suggesting other considerations, too.) But these are four of my most common pieces of advice and things that can help improve one’s experience. One year ago today—March 22, 2018—I reflected on the “trickle” of law school closures. Some campuses closed (Cooley’s Ann Arbor branch, Atlanta’s John Marshall’s Savannah branch), two schools merged into one (William Mitchell and Hamline), and others announced their closure (Indiana Tech, Whittier, Charlotte, and Valparaiso). In the last year, Arizona Summit and Western State have announced their closures. Western State closing two years after Whittier is a remarkable turn for legal education in Orange County, California. Orange County, with more than 3 million residents, is one of the most populous and fastest-growing counties in the United States. California has long had a number of state-accredited schools in the state, schools that do not have full ABA accreditation. Western State has been around since the 1970s but was not the first school to gain full ABA accreditation—that was Whittier in 1978. Western State joined newcomer Chapman as fully accredited in 1998. Then UC-Irvine was accredited in 2011. But now two of those four schools have closed. While we are a long way from the recession, and while law school enrollment has stabilized (and slightly improved) over the last few years, there remain longstanding pressures on legal education, in part from the legacy of the recession—small class sizes can only be sustained so long, scholarships have increased to attract students, the transfer market has disproportionately impacted more marginal schools, lower credentials of incoming students have translated into systemic lower bar passage rates, and so on. We may still see a few more closures in the years ahead—for-profit schools schools have borne the brunt of the closures, but we’ll see what happens in the months to come. The USNWR law “specialty” rankings long operated this way: schools would identify one faculty member whose specialty matched one of the various USNWR specialty categories (legal writing, trail advocacy, tax, etc.). USNWR would send a survey to those faculty asking them to list up to 15 of the top schools in those areas. USNWR would then take the top half of those schools who received a critical mass of votes, and rank them based upon who received the most votes—just ordinal rank with no total votes listed. For many specialty areas, that meant 10 to 20 schools. And for the other 180 to 190 schools, that meant blissful ignorance. USNWR changed that methodology this year in a couple of ways. First, its survey asks voters to rank every school on the basis of this specialty on a scale of 1 to 5, similar to how the peer reputation survey works. Second, it ranks all the schools that received a critical mass of votes (i.e., about 10 votes—and most law professors are not shy about rating most schools). Third, it now lists that reputation score, ties and all. The result is that almost all schools are ranked in almost all categories. And now your school might be 33d or 107th or 56th or something in a category. The result in some categories is comical compression in some categories. A score of 2.0 (out of 5) gets you 91st in International Law, and a score of 1.0 (the bottom) gets you to 177th. Ties are abundant—after all, there are usually at least 180 schools ranked, and given that the scale is from 5.0 to 1.0, and that virtually all schools are in the 4.0 to 1.0 range, there are going to be a lot of ties. Worse, now schools can advertise their top X program, when X in the past typically wouldn’t drop past 10 to 20. Now, top 30, top 50, top 100 all earn bragging rights. So now there’s a new arms race. Schools know exactly where they sit in this year’s survey, how tantalizing close the next tranche of the ratings are (because of the ties), how much higher that ranking is (again, because of the ties), and the temptation to pepper prospective voters with more marketing materials in the ever-escalating race to climb the ranks of a new set of specialty rankings. In the past, it was blissful ignorance for those below 20th. Today, it’s all laid bare. Perhaps I’m wrong. Maybe schools will mostly ignore the change to the specialty rankings. The compression and ties alone should cause most ot ignore them. But, I doubt it. The allure of rankings and the temptation of marketing departments to boast to prospective students and alumni about some figure (especially if that figure is higher than the overall USNWR rank) will, I think, overwhelm cooler heads.